Did you know that Jeepney Drivers can become millionaires? Yes, I know they’re some of the poorest people in the Philippines and that they earn around P300-400 (around $7) a day on average… but never underestimate that. They CAN become millionaires even with that income, and you know what…? The first box contains P1 MILLION. The second box contains trash: empty junk food wrappers, empty beer bottles, cigarette ash, old and ripped clothes, broken gadgets, etc. If you learn and use the lesson here, you will get the first box. If you don’t, you’ll get the second box, just like everybody else. So how CAN a Jeepney driver become a millionaire even if they only earn P350 a day? Let’s find out. Imagine YOU’RE the jeepney driver. You learned from an internet article that it’s possible to become a millionaire by investing, so you went to an internet cafe to learn more about it. Since your dream is to provide a better livelihood for your family, you wanted to learn how to do it correctly. Later, you saved a bit and bought some finance books in Tagalog (and some in English) from a nearby bookstore, and then you read to learn how to choose good companies (stocks), mutual funds, and other assets to invest in. You went to an internet cafe to read about those companies and assets and you discovered that they are not scams and that they are very stable investments with good earnings. You even invested in a lot of companies/funds/assets so even if one fails, at least the others will keep growing. You know a farmer doesn’t plant just one tree; he plants hundreds. If one fails, there are 99 more that will keep giving fruit. Now let’s say your investments give 8% average compounded interest every year (usually equities like stocks and stock funds, or maybe even real estate, gold, etc). Now imagine that as a jeepney driver, you earn an average of P350 a day. You saved 10% first before spending, so you saved around P35 every day. Since you work 5 days a week, you’ll save P175 every week. With 4 weeks a month, you save P700 each month. Whenever you have enough to buy an investment, you review it before using your savings there. Although your investments’ value sometimes decreases and you lose money, sometimes it also increases and you earn a lot of money. On average, your investments earn around 8% a year (if you calculate across decades). Remember that some Jeepney drivers earn less than P300 a day, others earn P400, and still others earn more… yet most of them have no savings. Why? After regular bills like water, food, and electricity, if we have money to buy something we want, like another cup of expensive coffee, another bottle of beer, an extra shirt, an extra pack of potato chips, or even an extra cigarette stick, we keep buying things until we spend all our money. That’s why we never have savings. The only way to make sure you save money is to SAVE FIRST before you spend anything. Like income tax, you learn to live without that money and you still get to buy things you want and enjoy life with most of your friends. The only difference is that you have savings and investments that will someday make you rich, and they won’t (unless you teach them how to do it too). Step with your left foot, step with your right foot, repeat those two steps again and again for a long time and you can reach the furthest provinces and mountains, rivers and oceans. That’s the same thing you did here: Save, and Invest, and do it again and again for decades to build a fortune. *You only earned P350 a day for 40 years, and your investments on average have an 8% return. Second column is how much you have now. Here we’ll call it Capital (or approximate net worth). 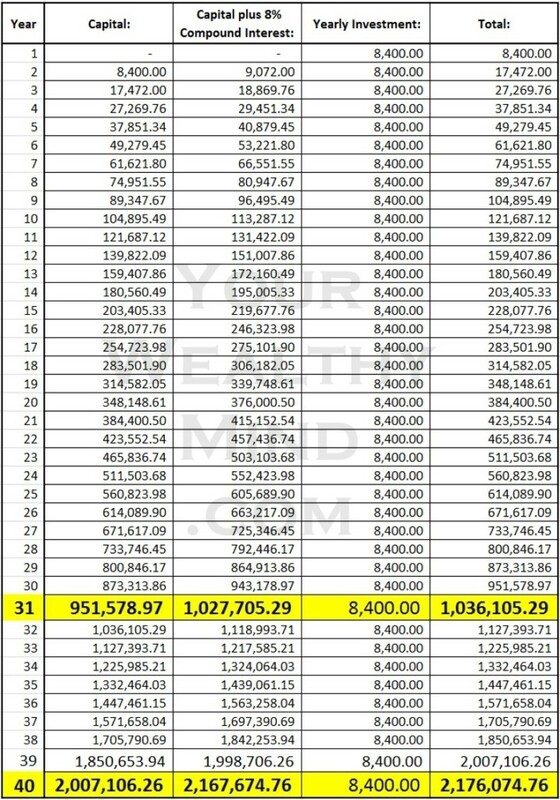 Third column is how much you have after it earns 8% compound interest. Fourth column is your investment of P8,400 a year. Fifth column is the total that year. 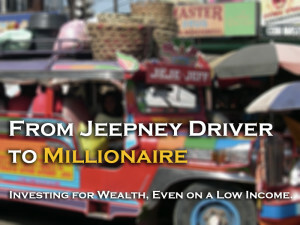 You only needed 31 years to be a Millionaire as a Jeepney Driver! In 40 years, you don’t have just P1 million in the box: You have TWO MILLION PESOS. Now we KNOW it’s possible for a Jeepney Driver to become a Millionaire. It took 31 years to earn P1 million, but why do you need less than 9 years to earn the second million? Easy: Remember that in your first few years your investments are less than P100,000. How much does that number earn at 8% interest? P8,000. With P8,000 a year, how many years will you need to earn P1 million (not compounded)? 125 years. Now, in your 31st year you have P1 million. How much does that earn at 8% interest? P80,000. With P80,000 a year, how many years will you need to earn P1 million (not compounded)? Just 12 years and 6 months. Then you add your yearly investment and THEIR compound interest earnings and you earn the second million faster. Imagine yourself going to a car dealer with a hundred cars lined up for sale. The salesman points you to a shiny, bright red car that the salesman says used to belong to a professional racer. …you find out that the engine is completely broken. Then you find out there are no refunds and no insurance. You lost hundreds of thousands of pesos buying a broken car, all because you didn’t know how to choose correctly or try to inspect it. Investing is similar. If you never learned to do it properly and choose the correct investments, you’ll face disaster. If you made a mistake, you don’t blame the car (your investment vehicle), the road (economy), or the laws of physics (the world). Blame yourself for choosing the wrong car (and believing the scamming salesman). You must learn how to choose the correct assets yourself. If you only studied how to choose a car properly and looked closely at all the cars for sale, you’ll find that there are DOZENS of sports cars that are in great condition, and they’re sold at a discount. So how do you choose the correct investments? Simple: LEARN HOW!! 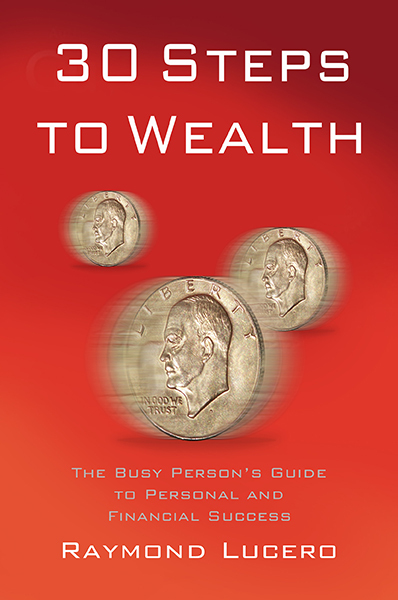 There are MANY books and seminars, internet articles and blog posts (like this one) on personal finance and investing, so learn from them one by one and use what you learned. Even with a low income of P7,000 a month, it’s still possible for a Jeepney Driver to become a millionaire. Now what about you? What do you do and how much do you get paid? Are you a sales agent? Office worker? Supervisor? Manager? …YOU CAN DO IT TOO!! One box will contain millions of pesos: The results of your hard work, wisdom, and discipline. The other box will contain all the trash you collected because you chose to spend ALL your money instead of saving and investing for your future. Which one will you have earned? • What does saving 10% mean to you? Nine bottles of beer instead of 10? Nine packs of potato chips instead of ten? Four new clothes this month instead of five? That tiny savings is the seed of your wealth, and you will never have the million peso box if you never earned it. • We can generally tell what our future will bring depending on what we do every day. Based on how much you’ve been saving up until now, when you retire and die, what will you leave your children? A heavy hospital and funeral bill, or a grand estate? When you die right now, what will you leave your family? • By watching you all those years, what did your children and grandchildren learn from you? o Did they learn to spend all their money and never think about the future? o Or did they learn to live below their means and invest to become financially healthy? Tiny problem: After 30 years the 1 million Pesos will not have the buying power like today. Meaning, inflation will cut down your saving efforts. Agreed. P1m now is not the same as P1m 30 years into the future, and that’s precisely the reason why we should learn to invest in assets that grow faster than inflation. By checking the average annual returns of the PSEi, we can see that it’s been at around 8.84% from 1995 to 2017 (data here, just take the average of the “Percent Gain or Loss” column). I might have overshot the data a bit as I was using USA data from investing books (12% average annual returns, 4% inflation, leaving around 8%), but the principle is still there. P1m won’t be worth as much in 30 years as it is now… but it’s certainly better than ZERO if people don’t learn how to invest. That’s the main point of the article. Thank you for reading by the way!